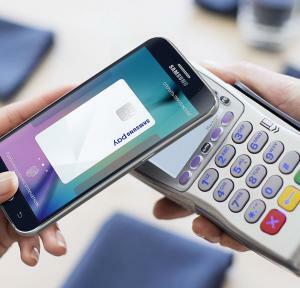 Samsung Pay Launches in UK Without Major Banks or MST Technology | NFC Times – Near Field Communication and all contactless technology. Samsung Pay launched in the UK today, trailing both Apple Pay and Android Pay. NFC TIMES Exclusive Insight – Samsung today finally launched its Samsung Pay mobile payments service in the UK, well behind rival payments services Apple Pay and Android Pay. Samsung appears to have had trouble signing up UK banks, managing to bring only three issuers on board for the launch: Santander, Nationwide or MBNA, none among the largest UK financial institutions. Samsung has reportedly said HSBC, one of the largest banks by assets in the world, would launch with Samsung Pay soon, along with a few other issuers, including American Express. By comparison, both Apple Pay and Android Pay have signed up several of the country’s major banks. Apple Pay launched in the UK in July of 2015, with Android Pay following in May of last year. The “Pays” wallets in the UK support both Visa- and Mastercard-branded cards. These schemes also tokenize the card accounts users load into their wallet apps. Article has about 660 words.